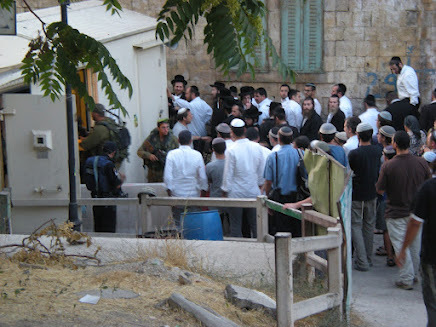 In Hebron on the evening of July 29, almost 100 Israeli settlers from the illegal settlements occupying the centre of the city crossed into the Palestinian-controlled area H1. The settlers illegally entered H1 supported by a heavy Israeli military presence. Earlier that evening, 4 Israeli military vehicles were witnessed driving through H1 area. At the same time, some 60 Israeli settlers gathered at Checkpoint 56 which marks the border between H1and H2 (the Israeli-controlled areas of Hebron). Several of the settlers, besides being armed with assault rifles, were also carrying compact tables and large bags of food. Shortly before 7 p.m., Checkpoint 56 was closed to all Palestinians. Soon after, the Israeli military escorted the settlers through the checkpoint into the Bab al-Zawiyeh neighbourhood of area H1. After the group of settlers passed through, Checkpoint 56 was reopened to Palestinians but the streets of Bab al-Zawiyeh were closed to Palestinian pedestrians and cars who were told to use a parallel street. The 4 military vehicles seen earlier were now parked and soldiers forced Palestinian shops to close down. Thus the otherwise lively Bab al-Zawiyeh was almost deserted. asked for the CMZ paper permit he replied,“this is a Closed Military Zone because I say so.” The same commander pushed several International Solidarity Movement volunteers in the chest for their inquiries. Several Palestinians attempted to enter to their homes in H2, as they regularly would, but were aggressively refused at the checkpoint and directed to a lengthy detour. The detour is made kilometres longer by the fact that Palestinians are denied access to Shuhada street. At 7:30 p.m., just before eftar when most Palestinians would be breaking the day’s fast, a group of about 30 settlers gathered at Checkpoint 56. A short while later, this group was escorted down the closed-off street to join the other settlers now numbering almost 100. 20 minutes later, a group of 20 settlers returned back towards H2. As they passed the empty square of Bab al-Zawiyeh they clapped their hands and started chanting in Hebrew, celebrating the empty Palestinian streets. Several pointed, laughed, and made rude gestures at the few Palestinians remaining on the edges of the street. At around 8:30 p.m., the settlers returned to H2 in smaller groups and escorted by soldiers. Again they pointed, laughed, and took photos of Palestinians they passed. At 9 p.m., the last soldiers packed up and left the area. Immediately, shops reopened and Palestinians returned to the streets. Slowly, Bab al-Zawiyeh began to look like itself again. More than 50 soldiers and almost 100 illegal Israeli settlers were participating in what is a yearly event. Annually, dinner is had at a site in Bab al-Zawiyeh which they consider a sacred place in Judaism. In practice, this dinner serves as an aggressive reminder of who is in charge. That Israel with more than 4000 soldiers stationed in Hebron, can do as they please despite what the lawful agreements may dictate. 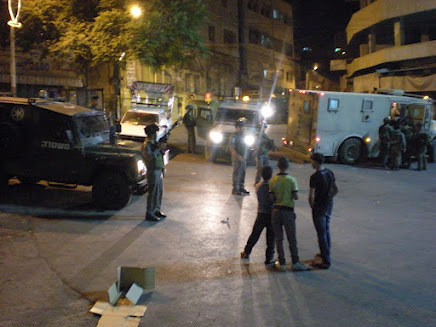 It is noteworthy that this occurred in a week that has been rampant with military night raids, harassment and abuse against Palestinian residents of Hebron who are celebrating the month of Ramadan. Jonas Ravn is a volunteer with the International Solidarity Movement (name has been changed).